Cost was not a consideration. The company has previously said it will commit ￡2bn to the project, including ￡200m to be spent in the UK on research and development and test track facilities - much of which has already been spent. 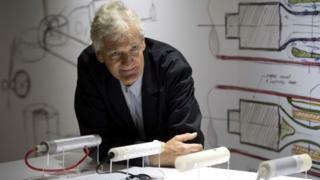 Dyson has not yet revealed what kind of batteries its new cars will use, or where they will be made. It recently wrote off ￡46m of its investment in American solid state battery development company Sakti3 - which it bought in 2015 for ￡58m. Industry experts say that solid state batteries - which can potentially be charged faster and hold a greater charge for longer - are still in an experimental phase. Dyson continues to develop both solid state and traditional lithium ion batteries in parallel. The company's founder, Sir James Dyson, has been a prominent advocate for Brexit and recently insisted that the UK leaving the EU with no deal would "make no difference". His critics say this approach is because his company is less vulnerable to the same problems as other car manufacturers, who have supply chains that include components that cross between the EU and the UK many times. Several major manufacturers, including BMW, Airbus and Jaguar Land Rover - who manufacture in the UK - have recently sounded dire warnings about the impact of a no-deal Brexit on UK investment.